Zentangle is a simple to learn, relaxing and mindful art form that allows one to slow down and focus while putting pen to paper and creating art. While drawing simple pen strokes and following the Zentangle Method, you'll enter a state of relaxed focus and calmness as you put pen to paper. The practice of Zentangle has many benefits including lowering stress, allowing focus on the moment and encouraging right brain activity -- all while producing a work of art. Zentangle seems to combine two things that I enjoy: art and meditation. I like to say that if you take a class, then you'll have a hobby for life. 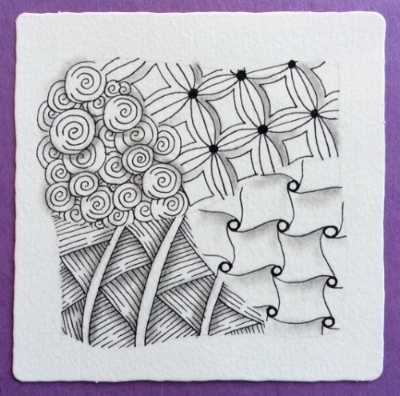 Zentangle enhances creativity, increases focus and provides a sense of contentment. It's also enjoyable and fun! Some called it Yoga with a pen. We happen to live in an increasingly accelerating and connected world. While this offers benefits it also has its costs. People have access to information yet many feel overwhelmed and isolated. One way to achieve balance in your life is to tap into creative expression which exercises your right brain. Whether you dance, sew, play an instrument, paint, garden, cook or partake in any creative endeavor, you will feel better for doing it. And, your right brain, which craves this activity, will thank you! The feeling of enjoyment, focus and 'being in the zone' that you achieve with Zentangle is a healthy practice for a balanced lifestyle. The founders of Zentangle®, Maria Thomas and Rick Roberts, teach that the first step in The Zentangle Method is gratitude and appreciation. What a lovely reminder and approach to art and life. I'm grateful to have discovered Zentangle because it brings me to a place of focus and calm while making art. I love sharing Zentangle with my students and friends. And I thank my students for being part of my creative journey. We continually learn from one another. Participating in cooperative, artistic communities also enhances human connection and well-being. I've found that participating in The Morgan Hill Tangle Club is one such a place and I hope you will meet with our group of Zentangle enthusiasts. It's a casual, supportive and positive community. I hope you'll try Zentangle and experience this simple to learn, meditative, appealing and calming art form that unlocks your creative potential and enables one to practice mindfulness.